In the USA, the category of edible gelatinised substances typically falls under the name “jello” (see JELL-O, lo the power of branding), whereas the word “jelly” is reserved for clear, fruity preserves meant for spreading on toast. In the UK, “jelly” also describes such toast-friendly substances, but it can also mean a set liquid, what we Americans call “jello”. This caused me great confusion when I first moved to the UK, searching hopelessly for UK “jello” recipes. But when I discovered this incredible double meaning of the world “jelly”, my whole world opened up to me. (FYI: I will not get into “spermicidal jelly” in this post). The jelly obsession has emerged over the last couple years as I’ve continuously failed to transplant my family Thanksgiving recipe for “Auntie Jo’s Cranberry Jello Mold” to the UK. The recipe relies heavily on “red” JELL-O, not readily available in this country. I tried making something up using gelatine, which I didn’t feel good about knowing that gelatine is not vegetarian. (In the process, which involves a can of crushed pineapple, I also learned that fresh pineapple will undo the effects of gelatine – blasted bromelain!). So what started as a quest for my family’s cranberry “jelly”, has evolved into a mission for vegetarian gelatinising agents, and also “jellied” creations that are free of crap (like JELL-O). I have been experimenting and have so far had my greatest success with agar agar, a substance made from algae, discovered in 1658 by Minora Tanzaemon in Japan, and hence very popular in Japanese and Vietnamese cuisine. Agar agar is great because it sets very quickly and doesn’t need to be refrigerated to do so. Plus, it’s all natural and totally vegan. I think we have a winner! My favourite agar agar creation so far is this Tiramisu Jelly, which I made three times (!!!) while in Chicago over the holidays. It was that good, and surprisingly easy. I used the agar agar to set coffee which had been poured over ladyfinger biscuits, then topped with a cream cheese frosting spiked with brandy (the “proper” way is with marscapone and Italian marsala wine, but this is much more frugal). This was much easier than making traditional tiramisu (which I did last year over Christmas, a process which seemed to take days to complete, but man it was good). 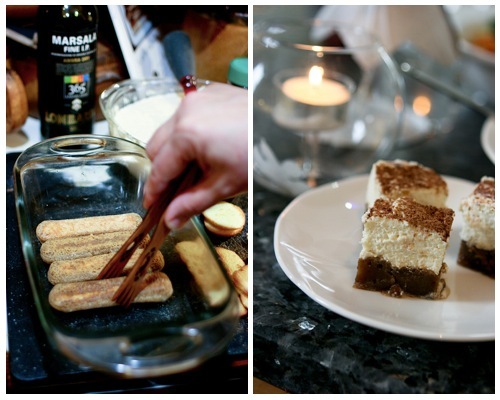 And I really enjoyed the mouthfeel of jellied biscuits – I suppose you Brits may call this a tiramisu trifle! The tiramisu jelly also slices up nicely for fun little party poppers, which we enjoyed on New Years Eve, topped with pop rocks! Consequentially, I’m posting this today because I’m currently in Cambridge for a weekend of hunkering and geeking with friends (sort of a Thanksgeeking redux) and the question of “what are you going to gelatinise this weekend?” came up. I haven’t answered that question yet, but having mastered the tiramisu, the pesky pineapple – my nemesis – comes to mind. Stay tuned! You can use whatever you want to set the jelly in, preferably a small square or rectangular pan. Even a bread pan would work. The bigger the pan, the shallower the jelly will be. I tend to err for a smaller pan and add as much liquid as needed to cover the biscuits, then set any leftover liquid in a cup for a little jelly bonus snack for the chef! Arrange the ladyfingers in a “small” square or rectangular pan. Combine the coffee, sugar and agar agar in a pan and simmer for a few minutes until the agar agar and sugar are dissolved. Pour the liquid over the ladyfingers, adding enough to cover the lady fingers – you may need to push the ladyfingers down into the liquid to get them to absorb and settle. I usually add enough liquid so that there’s a few millimetres of liquid above the biscuits, but you can add more liquid if you’d like a thicker jelly layer. While the jelly sets (which won’t take long – agar agar sets wonderfully quickly and it doesn’t need to be refrigerated). Meanwhile, mix the whipped cream with the cream cheese, brandy and sugar. Serve the jelly in slices, sprinkled with popping candy if you’d like for a fun surprise effect. I’m so thrilled to have this recipe at last… having partaken of this while you were here in the US, I can vouch for its massive success. Absolutely fabulous… and I’m so happy your experiment was a huge success. Ready for more. Anytime. Especially now. 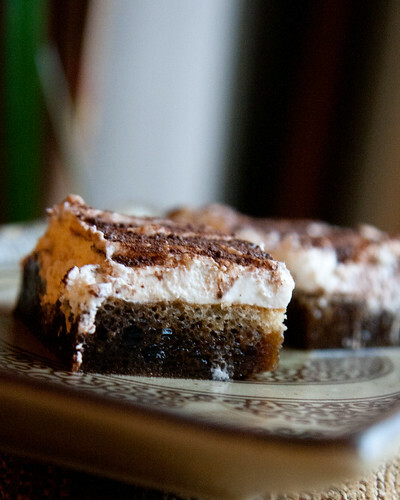 Lovely idea – the jellied tiramisu! Agar agar is great, but I would say the nature of the jelly is different to gelatin, as agar agar sets more solidly, it is hard to get the wobble of gelatin jelly. I do like both very much though. p.s. I’m very glad you decided not get into “spermicidal jelly” here! What a wondrous idea! 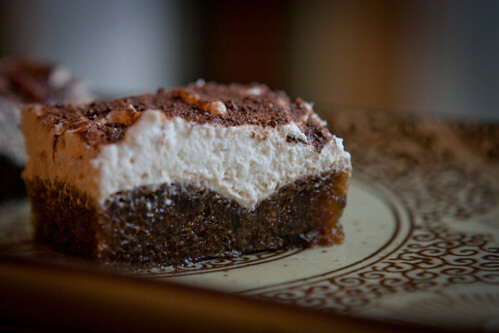 I have never been a fan of jellied anything but to be honest I am totally intrigued with this tiramisu idea. I have always hated trifle but I think it was the jelly/cream/sponge/fruit combo more than anything. And the artificial taste of the dreaded Jello back home. 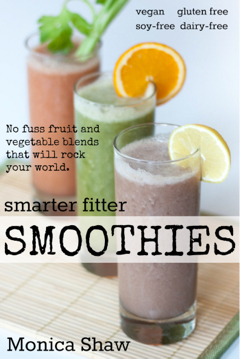 So, I may just have to make this very soon. I do wonder what you may be gelatinising next…If you are stuck, what about some kind of Bloody Mary?